Pink Kitten Dance School is proud to offer our students access to the Pole Dance Community’s Advancement and Acreditation Program (AAP). The Pole Dancing Community advancement and acreditation scheme, offers students the opportunity to be graded and earn recognition for the moves they have learnt and formally track their progression in Pole Dancing. Hannah is a 3 star pole instructor with the PDC and is able to assess your competancy at all levels. This is optional and we understand this will appeal to some students and not to others – this scheme runs in addition to our own teaching plans and levels. Membership costs £30 please contact the office to buy your membership. Once you are a AAP member you can apply to be graded at each level when you or your teacher feels you are ready. Grading costs £15 and will be done by Hannah this includes a certificate from PDC if you pass. Grading provides tangible feedback you on your progress and something to show! It shows that they are learning a recognised sport at a reputable school, which should help to dispel some of the misconceptions friends and family may hold. In order to unify standards across our membership, a universal grading criteria has been developed. 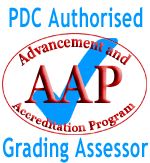 Students may progress through five grading levels and have their achievement recognised by all PDC Approved Schools. If a student moves location, they will be able to continue their grading progression at any other PDC Approved School. Students are graded according to criteria that have been decided democratically by all PDC Approved Schools. All PDC Approved Schools may grade students according to the agreed criteria. Grading test sheets and notes are provided to the schools to facilitate this.